This man Stewart is a bally genius and deserves NOT to be arrested for ticket touting or to have his money belt tickled by South African girls after his rand. Well done! Carry on! This is reportage of the highest order. It was just what the club footed folk of middle England want. 11.12am: If you're interested in finding out what it's like to be a fan travelling around South Africa, the excellent European Football Weekends blog is carrying a journal from Tim Stewart which is well worth a read. 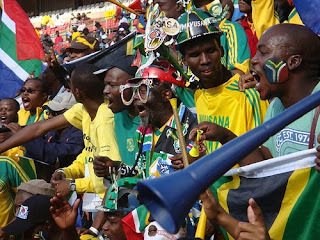 "Matchday 1: South Africa-Mexico. I set off from Sandton, an affluent suburb of JoBurg at 10am. There were no signs for Soccer City or any stewards/info/anything else World Cup-related despite it being the terminus for anyone arriving in JoBurg from the airport. I eventually found a shuttle bus supposed to take 30mins to the official stadium park and ride bus/Metrorail train. The freeway was totally gridlocked and we spent three hours on it. The Metrorail train did not move for an hour and then stopped for another 30 mins just outside Soccer City. Arrived at 3pm - five hours after setting off, missing the entire opening ceremony along with tens of thousands of others.The opening game had an attendance of only 85,000 when capacity was 97,000. I'm a much happier bunny after putting the early transport horror shows behind me and taking in the Holland, Brazil and Argentina games in the past few days. Factor into that seeing real-life North Koreans and partying in Soweto and all is looking up. As I said, it's worth a read - as is the entire site. It has been pointed out to me that my silly comment above could lead to terrible misunderstanding for Tim Stewart. I would like to point out here that I know Tim well and all his actions at the World Cup have been perfectly legitimate. My comment was written in a light-hearted manner and not intended to be taken seriously (British humour, I'm afraid).